A writer is defined as someone who uses words to express ideas and churns out essays, articles, press releases, short stories, novel, poetry, scripts, plays, and books. A professional writer knows how to meet the standards of publishing firms, media institutions, and websites owners. Of course, his ability to produce informative, interesting, and quality articles is important in proving his reliability and credibility. It is vital for every writer to read everything which he believes is essential to his job. Reading brings new ideas, widens the imagination, enhances creativity, and expands vocabulary. It helps a writer to find new writing styles to create better articles. The secret of informative articles come from the ability to utilize the ideas that come from research. Research helps the writer expound on a given topic, allowing him to supply the information needed by readers. People are always on the lookout for new articles that provide substantial content. Doing research enables a writer to express his ideas eloquently and successfully. Every writer admires great authors who influence his writing style. Learning from the best is good but to become a great writer, it is essential for him to find his own brand of writing. An expert writer prepares an outline to organize his materials and produces a good article. The ability to create a well-structured and smooth-flowing article is one of his remarkable qualities. The brain is in constant motion of assimilating information. A good writer needs to discipline his mind to focus on the essentials of his topic. The way he presents a concept, service, or product matters a lot because it triggers readers to act on something he wrote about. The purpose of any writing is to motivate readers to do something positive. He knows how to pique the interest of readers by establishing an emotional connection using the power of words. It is easier to impart ideas when a writer writes from a satisfied customer’s perspective. 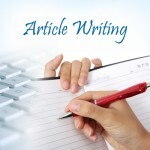 A professional article writer knows how to use the positive comments of consumers to create a good article. When he becomes interested in his subject matter, he knows how to present a point of view which he believes his readers will appreciate. Familiarity in the topic makes his ideas flow better. An efficient writer knows how to maximize his time to meet deadlines. He sets aside regular writing time to finish his articles. He focuses all his attention to his tasks during this scheduled period to finish his goal. He blocks all unnecessary activities to achieve his target and does not waste his precious time entertaining distractions. He knows how to behave like a pro. A professional article writer takes his work seriously. He takes pride in what he is doing, learning new things to perfect his craft and meeting the standards set by his clients. Practice makes perfect. A good writer is not afraid to grow. He challenges himself by getting unfamiliar writing projects which he finds interesting. He knows that the versatility to handle different types of writing tasks will make him a better writer. No matter what happens (well, there are exceptions like medical emergencies), a professional article writer finishes his article. He sticks to the task with complete focus. It really takes hard work and determination to become a professional article writer but the satisfaction of producing quality articles is all worth it.